It is never normal for children to experience foot and lower limb pain, especially pain lasting more than a couple of days. Foot and lower limb pain in children often go unnoticed. This is because signs and symptoms are often subtle, and sometimes children find it hard to explain what is wrong. Because of this, here are five warning signs parents should watch for in their children. If children lag behind in sports or backyard play, it may be because their feet or legs are tired. Fatigue is common when children have flat feet. The muscles in the feet and legs tire easily because the feet are not functioning as efficiently as they should. If they are reluctant to participate, it may be due to heel pain — a problem often seen in children between the ages of eight and 14. Repetitive stress from sports may cause muscle strain and inflammation of the growth plate, a weak area at the back of a child’s heel. Children may feel pain or notice a change in the appearance of their feet or nails but don’t tell their parents because they fear a trip to the doctor’s office. We encourage parents to make a habit of inspecting their child’s feet starting at a young age. Look for any changes such as calluses, growths, skin discoloration, or redness and swelling around the toenails. Repeated clumsiness may be a sign of in-toeing, balance problems or neuromuscular conditions. Injuries may seem minor, but if pain or swelling last more than a few days, have your child’s foot examined. A child with any of these signs or symptoms should be promptly examined by a podiatrist for proper diagnosis and treatment. 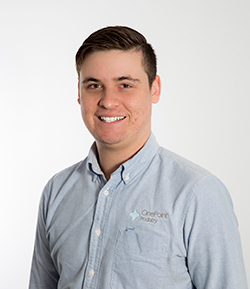 Kyle Perry is head of podiatry at OnePointHealth. 4732 5188.